Guitar players use the notes along strings 6 and 5 to track other notes on other strings, so the first thing to do is memorize the natural notes on strings 6 and 5. The natural notes are the letters A through G without any flat or sharp signs next to them. Here are all the natural notes on the 6th string between the open position and the 12th fret. 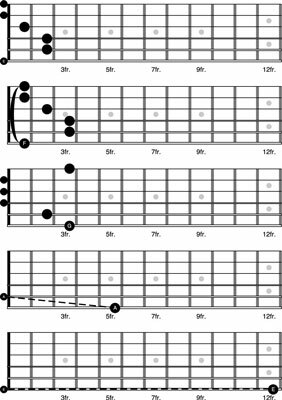 You may already be familiar with some of these notes because they’re used so frequently, especially as roots (the primary pitch from which a chord gets its letter name) to common chords. For example, the open 6th string is E, and it serves as the root of all open E chords, including E and E minor. The open 6th string is E and the root of an E chord. The 1st fret is F and the root of an F chord. The 3rd fret is G and the root of a G chord. The 5th fret is A; it matches the 5th string open and is used for relative tuning. Instead of looking at the fretboard empty and trying to remember its notes, connect the notes to something familiar, like common chord shapes and other strings. Try playing through the five notes in the preceding list forward and backward. Call out the notes as you play them to further cement them into your memory. The open 5th string is A and the root of an A chord. The 2nd fret is B and the root of a B7 chord. The 3rd fret is C and the root of a C chord. The 5th fret is D; it matches the 4th string open and is used for relative tuning. The 7th fret is E, an octave higher than the 6th string open. Musicians measure the distance between pitches (sound frequencies or notes) with intervals called whole and half steps. The distance between one pitch and the next is called a half step or semitone. On a guitar, a half step is one fret. Two half steps make up a whole step or whole tone, which is two frets. For example, E-F and B-C are half steps, while F-G-A-B and D-C-E are whole steps. 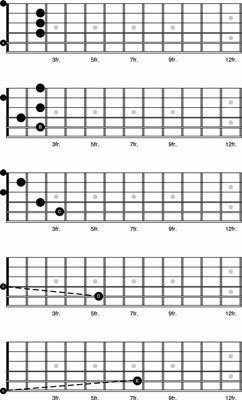 These pitches are always separated by these distances, regardless of where you play them on the fretboard. E-F and B-C are always a half step apart. All the other notes are separated by a whole step. The pitches between the natural notes are called flats and sharps. A flat is one half step lower than its corresponding natural note and is marked with a musical symbol that looks like a lowercase b (f). A sharp is a half step higher and is marked with a symbol that looks like a number or pound sign (s). To help you keep these two terms straight, think of the lowercase b as representing a lower pitched note or a flat being lower like a flat tire. When naming the pitches between the natural notes, look at the key signature to determine whether a note should be called flat or sharp. For example, in the key of E, you call the pitch at the 2nd fret Fs. The notes of E major are E-Fs-Gs-A-B-Cs-Ds. You don’t want to call the second note of the E major scale Gf because if you did, you’d end up with two Gs in a row and no F (E-Gf-Gs, and so on). The pitch in between F and G on the 6th string is either Fs, meaning one half step higher than F, or Gf, meaning one half step lower than G. Fs and Gf are enharmonic, meaning they’re two different note names with the same pitch. Similarly, the pitch in between G and A is either Gs or Af.